Another EMC meet that coincided with a good weather forecast. This was a new venue for us at the very well equipped Little Langdale hut. The good weather meant that an advance party went down early on friday. 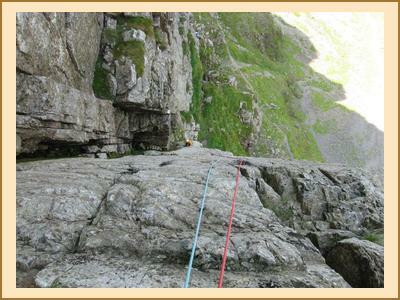 Keith & Martin got the ball rolling on Original Route at Raven Crag, the first of many 3 starred routes this weekend. 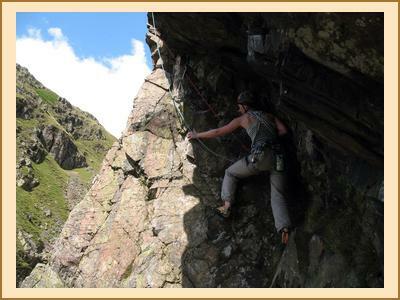 Kenny, Alison, Chris & Katrina went up to White Ghyll and climbed Slip Knot & Gordion Knot in very warm temperatures. Saturday was another fine day. Antti, Fiona & Mike slogged up to Gimmer and got their parking moneys worth with 4 classic routes in pleasant conditions. Chris and Alison went further afield to Scafell climbing the great looking Botterills Slab enroute to the summit and a final English "munro" tick for Alison. The other climbers headed off to Dow Crag with C Ordinary Route & Giants Crawl being climbed by Kenny, Katrina, Keith, Martin & Marcus. This wasn't just a climbing meet! Gillian & Margaret had a car free day from the hut over to the Old man of Coniston, as they were on the hill for 10 hours plenty more summits were done enroute. Alan, Anne & Sharon went to Scafell Pike. On Saturday evening a possible EMC first? Pimms for the ladies in the excellent 3 Shires Inn a few minutes walk away from the hut. Sunday was a showery day however everyone did something. Alan & Sharon went for a run round the Langdale Hills. Gillian & Margaret were also walking there including sharing their lunch with the ducks on Stickle Tarn. The climbers hunt for dry rock ended at Shepherds Crag and the run of classic routes continued with Fishers Folly, Little Chamonix, Ardus & Donkeys Ears being climbed. Getting straight onto Little Chamonix with no queues being particularly unusual. A great trip to the lake district and I would hope we have more meets down there as good as this one.